After algae, nothing brings an aquarium enthusiast to his or her knees like snails. They multiply like rabbits, only worse. Many are hemaphroditic, meaning they don't need to find a mate, they just replicate themselves. They are nearly impossible to irradicate unless you totally strip down your tank and start over. They can even mow through our precious plants. But are snails pure pest? After all, they do tend to have a voracious appetite for the number one enemy, algae. They also eat unmentionables that fish and shrimp leave behind, helping to break down waste. Some, like Malaysian Trumpet Snails, even aerate the substrate by digging into it, making it more hospitable for beneficial bacteria. However, if their population gets out of control, it doesn't make for an attractive tank. After all, sails aren't the prettiest things to look at. 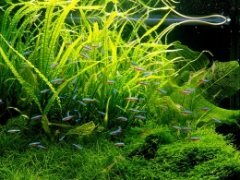 Obviously, some are better than others and many people have different opinions about which ones are good and which ones are bad for a planted tank. Most say Malaysian Trumpet Snails are harmless and the most beneficial for a tank. 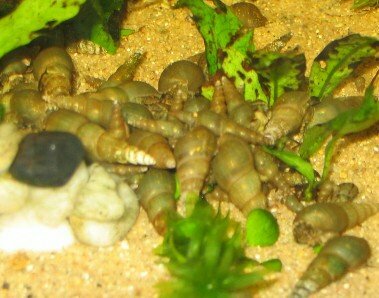 Pond snails are some of the worst: if you get even one in your tank, there will be 40 by the end of the week. Then 1600. Then 64,000. Well not exactly, but you get the point. My advice: stay away from all of them if you can. This is, however, nearly impossible. Eventually some eggs (they just have to be transparent) will make their way into your tank with a new plant. To control snail numbers, reduce feeding, eliminate algae, or manually remove them. It's not the most pleasant thing to do, but crushing them also gives your fish a tasty snack once they are broken open. Do not use snail killing chemicals because these will kill all sorts of other things, possibly other fish and plants. Or, you can get a snail eating fish, like a loach.